The clamshell incision, also known as a transverse sternotomy, is one of my favorite surgical incisions utilized in thoracic surgery. As surgical procedures become more and more minimally invasive with the use of robotics, and thoracoscopy, we sometimes forget the beauty of the clamshell incision for large-scale thoracic surgeries. As a frequent observer in the operating rooms of a variety of surgeons employing an array of surgical techniques and operative philosophies, I have a greater opportunity than most to consider the distinct advantages and disadvantages of this surgical approach. The clamshell incision is shaped like a curved ‘W”, and is typically performed in the anatomic skin / rib groove below the breasts. The surgeon then dissects through the tissue, and intercostal muscles to enter the pleural space bilaterally. It allows greater access than the traditional sternotomy, and has become more popular for bilateral lung transplantation (Durrleman & Massard, 2006). This technique has also been used to salvage lungs in donors that would have otherwise gone unused due to previous sternotomies (Zuin, Marulli, Loy & Rea, 2008). This incision gives the surgeon easy access to the heart and both lungs, and the great vessels and is sometimes used by cardiovascular surgeons for repair of the thoracic aorta and aortic arch. (Doss et al. 2003). This disadvantages of this incision are obvious; as a large chest incision; longer hospital stays, infection/ poor wound healing, and increased pain but when compared to a similar incision such as a sternotomy, the clamshell may prove superior. * If you have any medical photographs showing clamshell incisions that you would like featured at cirugia de torax.org, please contact me. Doss M, Woehleke T, Wood JP, Martens S, Greinecker GW, Moritz A. (2003). The clamshell approach for the treatment of extensive thoracic aortic disease. J Thorac Cardiovasc Surg. 2003 Sep;126(3):814-7. Doss, M., Woehlecke, T., Wood, J. P., Martens, S., Greinecker, G. W. & Moritz, A. (2003). The clamshell approach for the treatment of extensive thoracic aortic disease. Journal of Thoracic & Cardiovascular Surgery, 2003 Sept., 123(3); 814 -817. Durrleman, N. & Massard, G. (2006). Clamshell and hemi-clamshell incisions. Multi-media manual of cardio-thoracic surgery, 2006, Issue 0810. 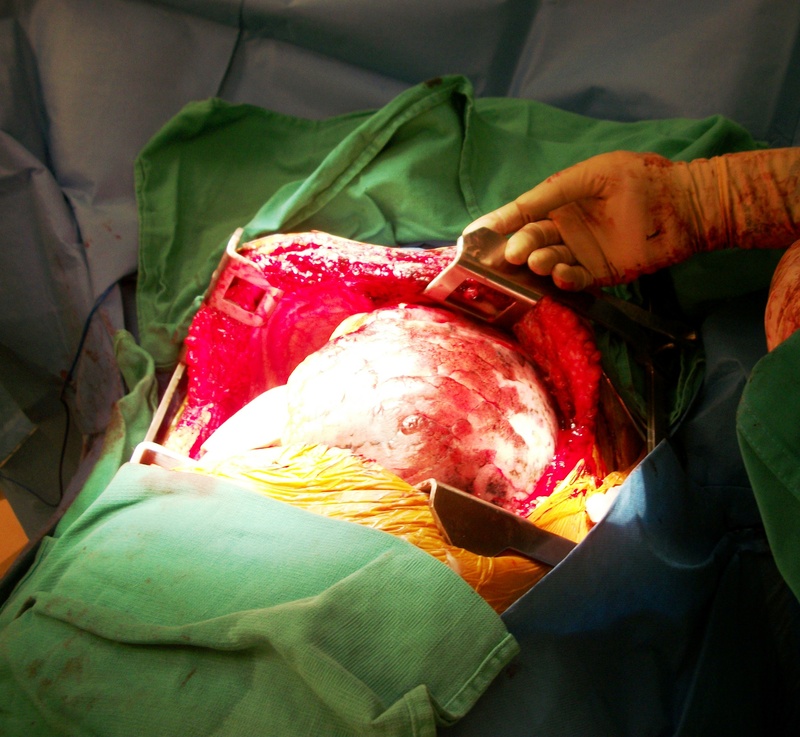 Full-text article with discussion of incisions, and intra-operative photos. Wise, D., Davies, G., Coats, T., Lockey, D., Hyde, J. & Good, A. (2005). Emergency thoracotomy: How to do it. Emergency Medical Journal, 2005;22:22-24. Full-text article with photos showing planned incision and exposure created by the clamshell incision.